Users of Vine finally have the option to share their videos after they are posted after the newly-released short video app from Twitter got an update that also adds an age rating, following issues with pornographic content. Version 1.0.5 of the app, issued today and first spotted by The Verge, brings the new sharing options and also sees the 6-second video app becoming the latest in a series of top services to get a 17+ age rating. Vine’s advisory was previously for users aged 12 and upwards, and the change follows the discovery of widespread pornographic content on the service. Vine follows Tumblr and 500px in adding the age rating. The 500px app was actually initially removed from the App Store all together over the concerns about content. 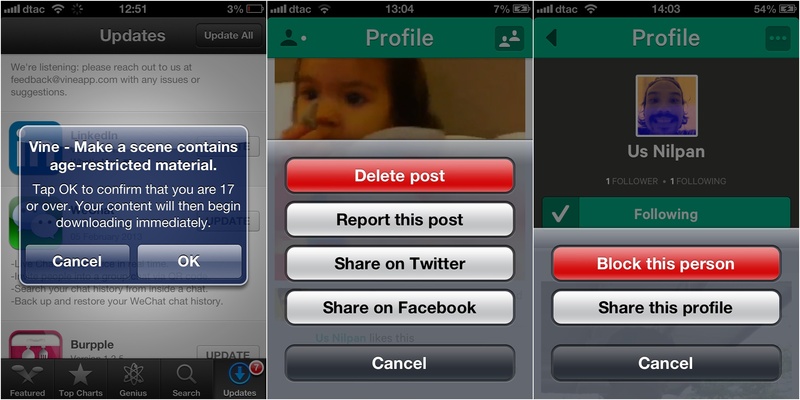 It was reinstated after adding the option to report photos. It remains to be seen what the age restriction warning actually does. It takes nothing more than the clicking of ‘ok’ for this check point to be bypassed — that could be done by anyone of any age — and it appears to be nothing more than tick-box activity that is done to fulfill the requirements to be in the App Store. In a related move, Vine also now has the option to report or block a user profile, that’s in addition to the pre-existing option to report a specific video. In the case of the report user button, this is another move to combat unsuitable content via its creators, while the block function mirrors that of Twitter’s own service. Focusing on usability, the addition of Facebook and Twitter sharing for existing videos is a welcomed one. Most other multimedia services allow content to be shared at a later date, which highlighted the lack of that option with Vine — as I recently mentioned on Twitter. Despite the changes, Vine doesn’t yet allow users to share other people’s videos to Twitter, Facebook or other services. That is still possible, however. As we wrote last week, if you have the link to a video, you can use the Vineit service to add it to Tumblr or embed it on other blogs.